Films about surviving near-impossible situations carry not only suspense but also some measure of existential angst - life suggests itself as feeble and brief when faced with the elements. Such thinking can provoke metaphysical, or spiritual, questioning of the lives we lead and challenges we meet. That films of survival are also about the overcoming of such circumstances partly explains their appeal; the audience can be shaken to its core but can also find comfort humanity’s resilience through the survival of essentially ‘good’ and capable characters. They can ultimately reiterate the heart-warming message that ‘what doesn’t kill us, makes us stronger’. In the past few years films such as 127 Hours (2010) and Life of Pi (2012) have provided audiences with such cosy survival-tales. Through careful character-development they tell stories of survival through relating the story of one single person, giving the audience a chance to avoid tougher existential questions by focusing on personal drama. 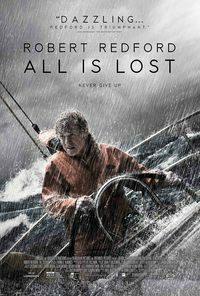 Director J.C. Chandor’s All is Lost however, takes this heavily rehearsed scenario and, through a few alterations, turns it on its head. It retains most elements of a traditional survival film: a lone adventurer (Robert Redford) is suddenly abandoned to the sea when he crashes into a stray container, which renders his communication equipment unusable, his yacht impaired, and eventually pushes him to the limits of physical and psychological endurance. However, the film’s main focus, paradoxically perhaps, is unusual for its genre; it focuses solely on the ongoing act of survival. Where other films focus mainly on characters - in order for the audience to fully appreciate the essentially humanistic ‘lesson’ taught - by way of dialogue, memories, and back-story - All is Lost leaves its audience alone with a struggle that is not about destiny or realisation. One might say that spiritual matters are avoided in order to portray the physicality of this struggle, the contingency of circumstances, or even the reality of the survival-instinct in the human animal. That would be an all too narrow reading, though, since the film cinematographically conveys neither realism nor any trace of objectivity. Rather, this film, by way of its situation-driven scenario, avoids pitting the spiritual, or psychological, realm of character against the material realm of situation and its demands, leaving them to coexist on one plane. And this is the real strength of Chandor’s film; it attempts to face this existential crisis directly, without bringing the audience solace in the form a psychological dimension affected by but separated from the events around it. Yet, in style, pace, and narrative, All is Lost is traditionally mainstream in a very restrictive way. Quick cuts, the celebrity of Redford, the spectacular computer-generated storms, and the reassuring end are deployed to keep audience entertained. This is in some senses a shame, because beside these elements there exists something at once intriguing and unusual. As Redford’s man starts losing all hope and energy in the midst of the Indian Ocean, the camera’s attention starts to drift. Serene underwater images showing beautiful shoal of fish and other life brings a new depth to the ongoing crisis - the situation is not over, nor any less harsh, yet it might be on the verge of being accepted. This brings a new dimension into the film, a sort of interiority which is not necessarily the psychology of a character but an offer to the spectator of a space for contemplation and dissolution which, if nothing else, at least delays that heart-warming message to the audience. In a sense, All is Lost is an extremely disappointing film, just because its parts show so much potentiality. This review was published on January 10, 2014.